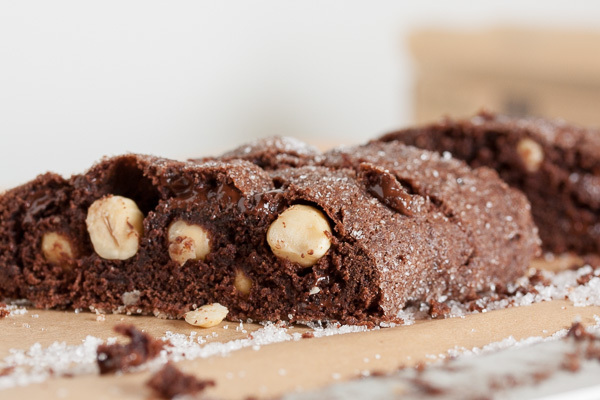 Double Chocolate Hazelnut Biscotti | wanna come with? I feel like I’m getting into a bit of a rut, cookie-wise. Work has been pretty busy for me lately, and come Sunday afternoon when I start thinking about baking something, I’m usually tired and wanting to make something simple. Roll-out cookies? Nah. Let’s make chocolate chip drop cookies again! I’ve made so many variations of chocolate chip cookies, and peanut butter cookies, and oatmeal cookies. 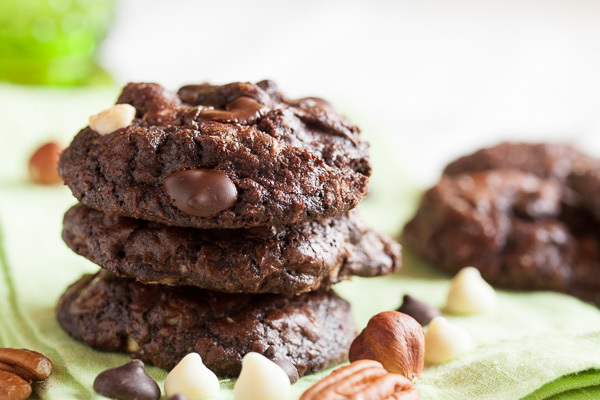 And there’s absolutely nothing wrong with that – everyone loves those cookies! They’re all definitely big crowd-pleasers. But I’m getting a bit bored. So while I still wanted something simple, I did want something a little different. And then I realized it’s been a reeeeally long time since I’ve made biscotti. In fact, I haven’t made any since the lemon pistachio biscotti I made a almost three years ago. Yikes! That’s been way too long. I’ll admit, this cookie wasn’t as popular as the old standard cookies, but the people who ate them loved them (me included!). And they even managed to lure in a coworker who usually never eats cookies (yay!). I think it’s just that some people aren’t fans of biscotti in general. And I get that, I do. I’ve certainly found myself disappointed by coffee shop biscotti that was either so hard I thought I was going to chip a tooth, or strangely soft and chewy. If I’d only ever had hard-as-a-rock biscotti before, I’d probably think I didn’t like it either. Much like scones, good biscotti is oddly hard to find. 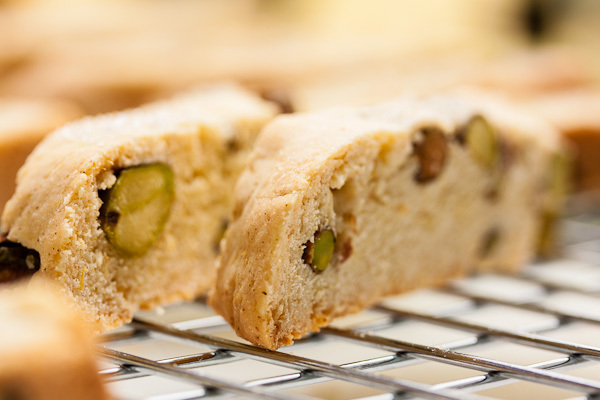 What makes a good biscotti? It’s all in the texture, really. It should be dry and crunchy – perfect for dipping in coffee – but it should still have a tender crumb. Meaning that while it’s crunchy, it’s still easy to bite. You shouldn’t have to gnaw on it with your molars to break a piece off. This cookie is amazing. 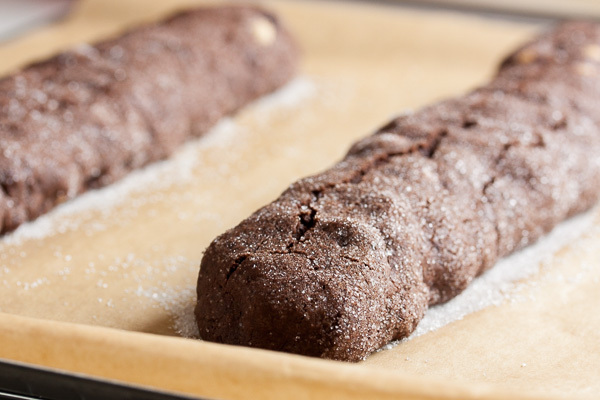 It’s intensely chocolate-y and has a perfect biscotti texture – crunchy, but still tender. You can taste a hint of the espresso powder, but mostly I think it just intensifies the chocolate flavour. The hint of orange is always a lovely counterpoint, but it’s not too strong. And of course the hazelnuts work perfectly with the other flavours (who doesn’t love hazelnut + chocolate?). 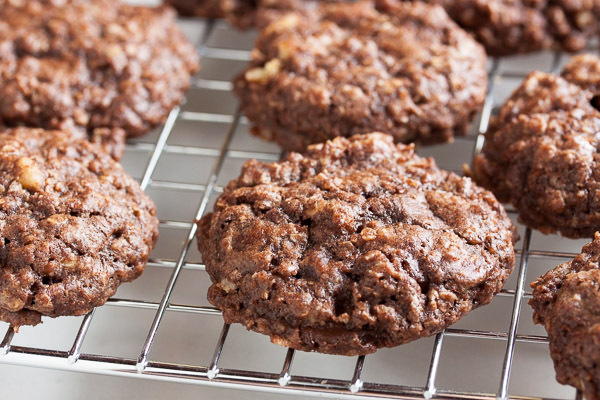 It’s a great cookie on its own, but it’s to die for when dipped in coffee. 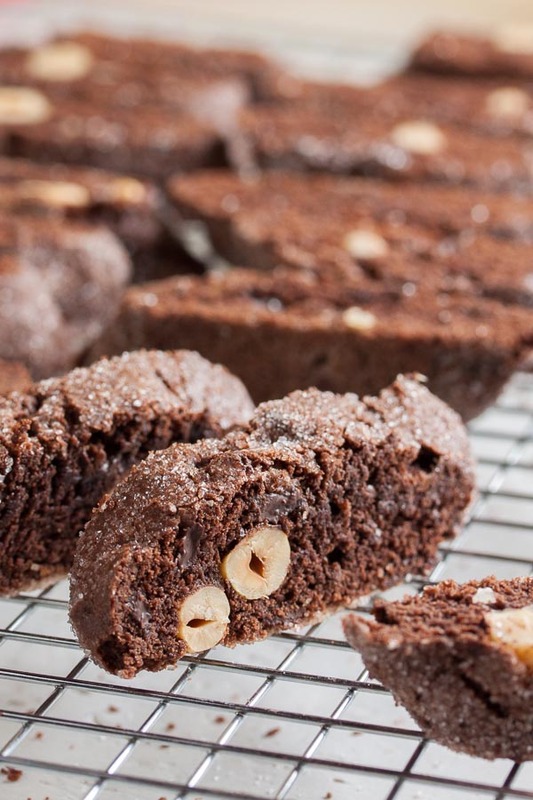 Adapted from Tracey Zabar's "Wicked Chocolate Biscotti" from One Sweet Cookie. The recipe says it will make about 45 cookies, and I got pretty close to that at about 50. To toast the nuts, spread them in a single layer on a baking sheet and toast them in the oven for approximately 10 minutes, turning them every few minutes or so to cook evenly. Trust your senses – they'll start to smell fragrant when they're ready. You can do this step and then set them aside to cool while you prepare the rest of the ingredients. In a medium bowl, whisk together the flour, cocoa powder, espresso powder, baking powder, and salt. Set aside. In the bowl of your stand mixer, combine the sugar and orange zest, rubbing them together with your fingers until the zest is distributed and the sugar is fragrant (the original recipe called for the zest to be added later, but I learned this method from Dorie Greenspan and prefer it for avoiding clumps of zest). Add the butter beat together on medium speed until light and fluffy, about 3 or 4 minutes. Scrape down the sides of the bowl and add the eggs, one at a time, beating well after each. Add the vanilla and beat again to incorporate. Divide the dough into four portions. Form each into a log, approximately 12" long. Roll each log in the sanding sugar, coating them as evenly as possible. Transfer the logs to your baking sheet – you should be able to fit 2 per sheet – and flatten them just slightly. Bake for about 25-30 minutes, rotating the pan halfway through the baking time. Remove from the oven and allow to cool on a wire rack for about 10 minutes. Once they've cooled, transfer the logs to a cutting board. Using a serrated knife, slice each log diagonally into about 3/4" thick slices. The original recipe says 1", but I think that's way too thick – the thicker cookies make it harder to get that lovely crunchy texture I like. I made those yesterday and they are delicious. Very rich chocolate flavor,, but not too sweet or overwhelming, perfect for those afternoon cravings ( or morning). I really like that you bite into the crunchy and dry biscotti and suddenly you hit the chocolate and it kinda “hydrates” your mouth a bit, I don’t know how to describe it, but I really liked the texture. Thanks for the recipe!